Work has commenced on the £76,000 makeover of Kielder Water & Forest Park Forest mountain bike trail network. The Forestry Commission is putting a call out for local people to help complete part of the work. The date for the next trail build is Saturday 4 and Sunday 5 April. Over the next few months volunteers are needed to help build new sections of bike trail. Work has already commenced on sections of the vast mountain bike trail network with help from the Kielder Trail Reavers (local volunteer mountain bike club) but more volunteers are needed. Partnership funding has been achieved through Northern Lands Project, which is supported by the Rural Development Programme for England (RDPE) 2007-13 through Department for Environment, Food and Rural Affairs (Defra) and the European Agricultural Fund for Rural Development. In-kind support comes from Kielder Trail Reavers and Northern Downhill, who have both used the network for events have contributed to maintenance of the trails over recent years. Forestry Commission project funding comes from monies raised from visitor parking within the park. 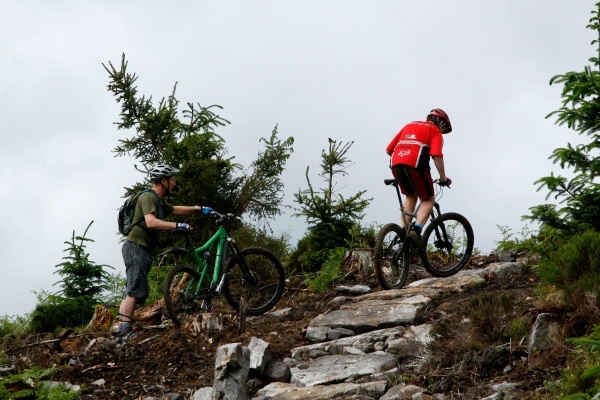 “It’s a very exciting time for Kielder Water & Forest Park 2013 was one of the busiest years for the park and on the mountain bike trail network since they were built- the great thing is mountain biking is popular all round and this is key to rural tourism businesses. In 2014 we are seeing a number of repeat events and also some new for the North of England such as an all night bike ride taking place on Lakeside Way raising funds for charity. We now need mountain bikers who love and use the largest forest in England to join the volunteer teams and help push the projects through to completion. A lot of mountain bikers love the forest, but don’t realise how important it to support the trail building locally.